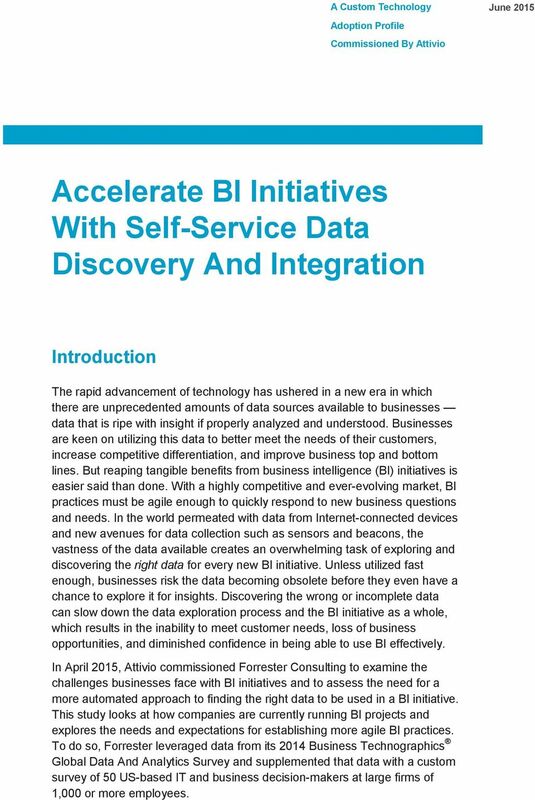 Download "Accelerate BI Initiatives With Self-Service Data Discovery And Integration"
1 A Custom Technology Adoption Profile Commissioned By Attivio June 2015 Accelerate BI Initiatives With Self-Service Data Discovery And Integration Introduction The rapid advancement of technology has ushered in a new era in which there are unprecedented amounts of data sources available to businesses data that is ripe with insight if properly analyzed and understood. Businesses are keen on utilizing this data to better meet the needs of their customers, increase competitive differentiation, and improve business top and bottom lines. But reaping tangible benefits from business intelligence (BI) initiatives is easier said than done. With a highly competitive and ever-evolving market, BI practices must be agile enough to quickly respond to new business questions and needs. In the world permeated with data from Internet-connected devices and new avenues for data collection such as sensors and beacons, the vastness of the data available creates an overwhelming task of exploring and discovering the right data for every new BI initiative. Unless utilized fast enough, businesses risk the data becoming obsolete before they even have a chance to explore it for insights. 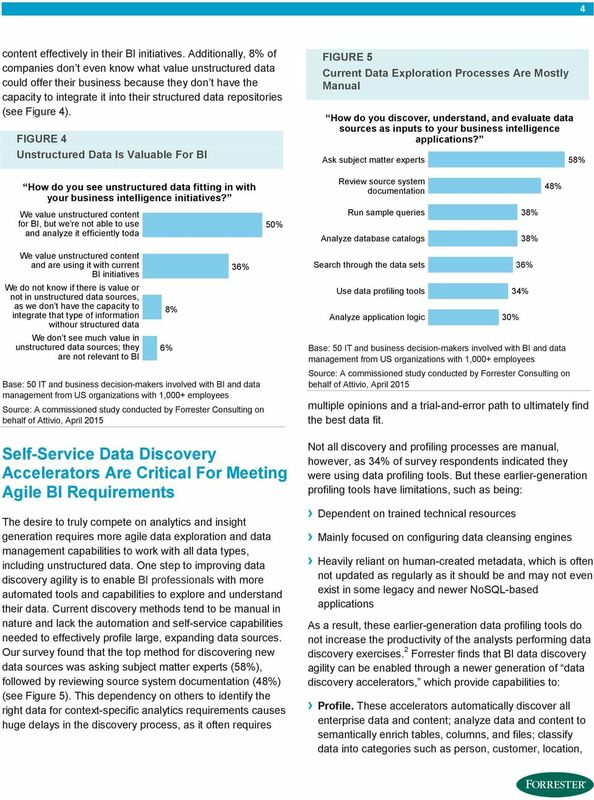 Discovering the wrong or incomplete data can slow down the data exploration process and the BI initiative as a whole, which results in the inability to meet customer needs, loss of business opportunities, and diminished confidence in being able to use BI effectively. 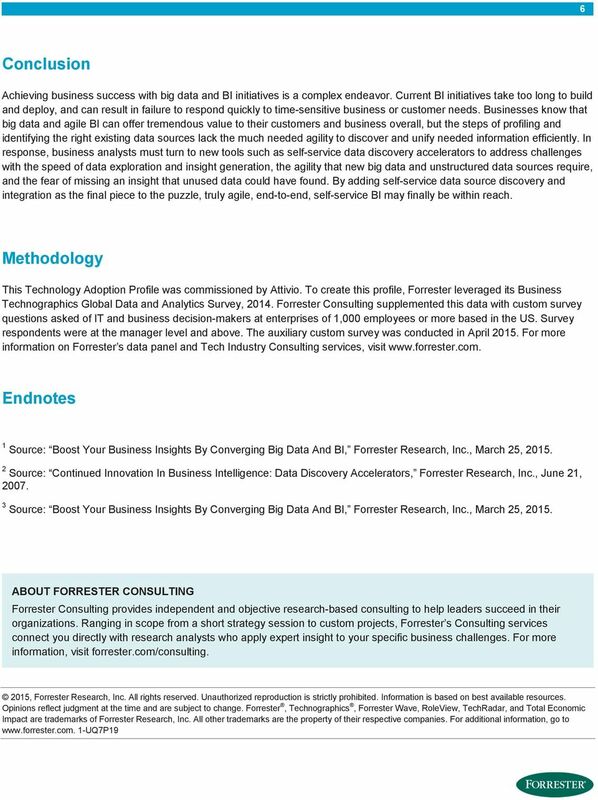 In April 2015, Attivio commissioned Forrester Consulting to examine the challenges businesses face with BI initiatives and to assess the need for a more automated approach to finding the right data to be used in a BI initiative. This study looks at how companies are currently running BI projects and explores the needs and expectations for establishing more agile BI practices. To do so, Forrester leveraged data from its 2014 Business Technographics Global Data And Analytics Survey and supplemented that data with a custom survey of 50 US-based IT and business decision-makers at large firms of 1,000 or more employees. 2 2 Business Intelligence Takes Too Long To Profile, Identify, and Unify Data Sources With the latest mobile devices and ubiquitous access to cloud-based products and services, customers are more empowered and connected than ever. This new environment generates vast amounts of data that, coupled with existing data sources, can provide tremendous opportunities for businesses to better understand their customers. However, despite the volume of data available, many businesses struggle with being able to quickly analyze data and turn it into actionable insight. 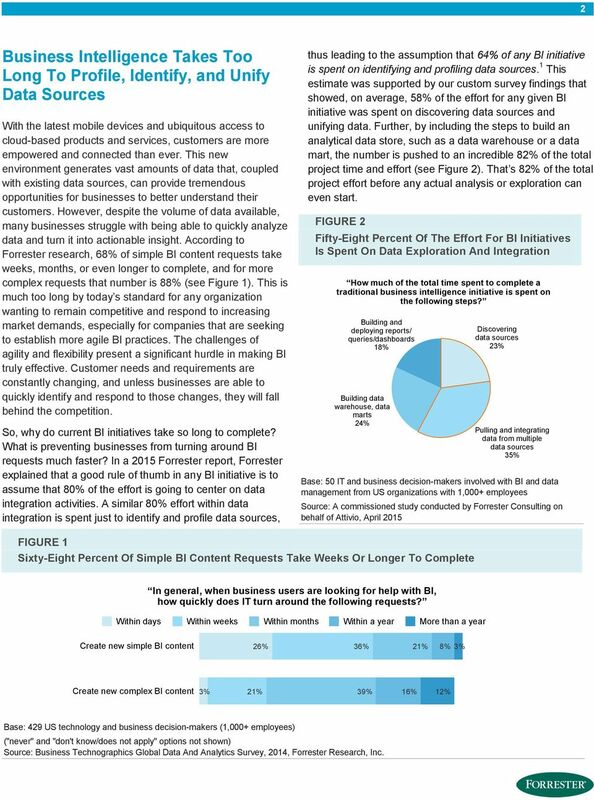 According to Forrester research, 68% of simple BI content requests take weeks, months, or even longer to complete, and for more complex requests that number is 88% (see Figure 1). This is much too long by today s standard for any organization wanting to remain competitive and respond to increasing market demands, especially for companies that are seeking to establish more agile BI practices. The challenges of agility and flexibility present a significant hurdle in making BI truly effective. Customer needs and requirements are constantly changing, and unless businesses are able to quickly identify and respond to those changes, they will fall behind the competition. So, why do current BI initiatives take so long to complete? What is preventing businesses from turning around BI requests much faster? In a 2015 Forrester report, Forrester explained that a good rule of thumb in any BI initiative is to assume that 80% of the effort is going to center on data integration activities. A similar 80% effort within data integration is spent just to identify and profile data sources, thus leading to the assumption that 64% of any BI initiative is spent on identifying and profiling data sources. 1 This estimate was supported by our custom survey findings that showed, on average, 58% of the effort for any given BI initiative was spent on discovering data sources and unifying data. Further, by including the steps to build an analytical data store, such as a data warehouse or a data mart, the number is pushed to an incredible 82% of the total project time and effort (see Figure 2). That s 82% of the total project effort before any actual analysis or exploration can even start. FIGURE 2 Fifty-Eight Percent Of The Effort For BI Initiatives Is Spent On Data Exploration And Integration How much of the total time spent to complete a traditional business intelligence initiative is spent on the following steps? Building and deploying reports/ queries/dashboards 18% Building data warehouse, data marts 24% Discovering data sources 23% Pulling and integrating data from multiple data sources 35% Base: 50 IT and business decision-makers involved with BI and data management from US organizations with 1,000+ employees Source: A commissioned study conducted by Forrester Consulting on behalf of Attivio, April 2015 FIGURE 1 Sixty-Eight Percent Of Simple BI Content Requests Take Weeks Or Longer To Complete In general, when business users are looking for help with BI, how quickly does IT turn around the following requests? Within days Within weeks Within months Within a year More than a year Create new simple BI content 26% 36% 21% 8% 3% Create new complex BI content 3% 21% 39% 16% 12% Base: 429 US technology and business decision-makers (1,000+ employees) ("never" and "don't know/does not apply" options not shown) Source: Business Technographics Global Data And Analytics Survey, 2014, Forrester Research, Inc.
5 5 and company; and evaluate quality metrics including cardinality, ranges, sparseness, null values, and outliers. Identify. These accelerators allow a searchable catalog of discovered and profiled sources; recommend new sources based on relationships with known sources; and use semantic search to handle ambiguity of terms and inconsistent data. Unify. These accelerators uncover relationships across data sets, spanning disparate databases and data and content types; autosuggest models based on referential integrity and join-ability from inferred relationships; and provision data to agile data discovery tools and advanced analytic engines. 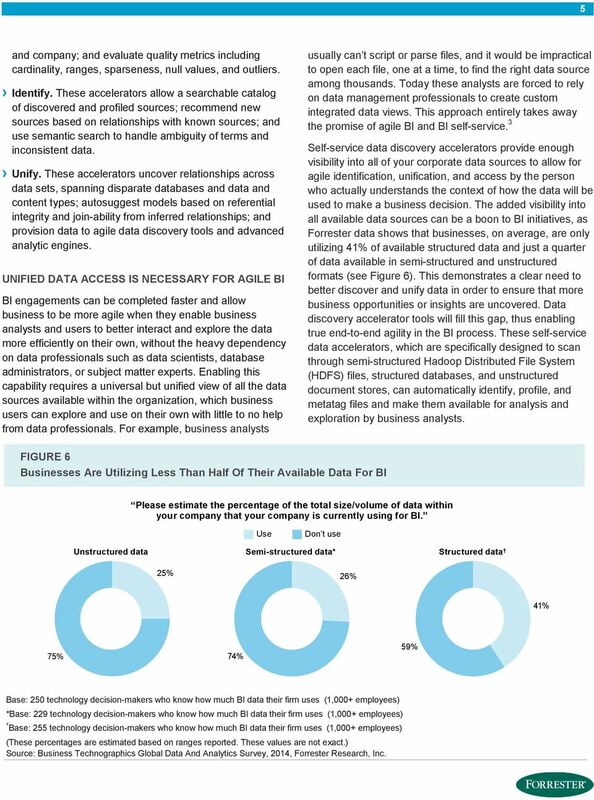 UNIFIED DATA ACCESS IS NECESSARY FOR AGILE BI BI engagements can be completed faster and allow business to be more agile when they enable business analysts and users to better interact and explore the data more efficiently on their own, without the heavy dependency on data professionals such as data scientists, database administrators, or subject matter experts. Enabling this capability requires a universal but unified view of all the data sources available within the organization, which business users can explore and use on their own with little to no help from data professionals. For example, business analysts usually can t script or parse files, and it would be impractical to open each file, one at a time, to find the right data source among thousands. Today these analysts are forced to rely on data management professionals to create custom integrated data views. This approach entirely takes away the promise of agile BI and BI self-service. 3 Self-service data discovery accelerators provide enough visibility into all of your corporate data sources to allow for agile identification, unification, and access by the person who actually understands the context of how the data will be used to make a business decision. 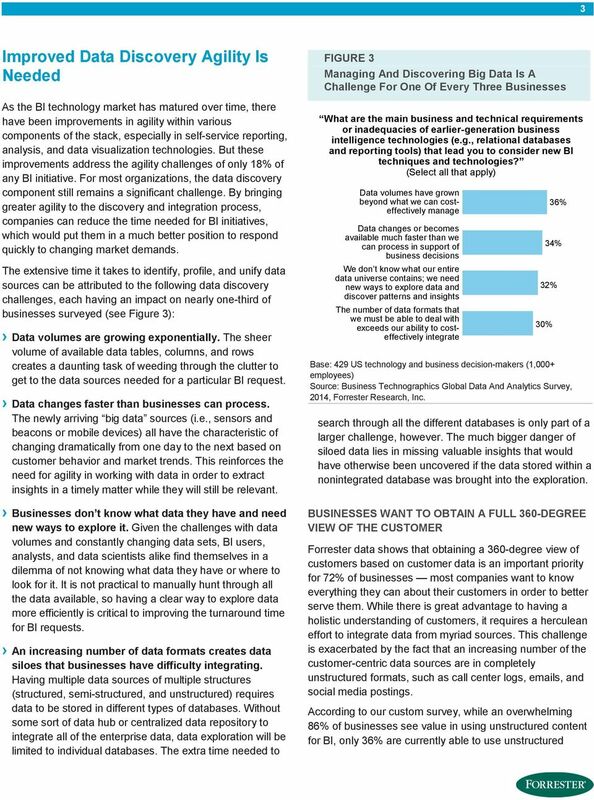 The added visibility into all available data sources can be a boon to BI initiatives, as Forrester data shows that businesses, on average, are only utilizing 41% of available structured data and just a quarter of data available in semi-structured and unstructured formats (see Figure 6). This demonstrates a clear need to better discover and unify data in order to ensure that more business opportunities or insights are uncovered. Data discovery accelerator tools will fill this gap, thus enabling true end-to-end agility in the BI process. These self-service data accelerators, which are specifically designed to scan through semi-structured Hadoop Distributed File System (HDFS) files, structured databases, and unstructured document stores, can automatically identify, profile, and metatag files and make them available for analysis and exploration by business analysts. FIGURE 6 Businesses Are Utilizing Less Than Half Of Their Available Data For BI Please estimate the percentage of the total size/volume of data within your company that your company is currently using for BI. Use Don t use Unstructured data Semi-structured data* Structured data 25% 26% 41% 75% 74% 59% Base: 250 technology decision-makers who know how much BI data their firm uses (1,000+ employees) *Base: 229 technology decision-makers who know how much BI data their firm uses (1,000+ employees) Base: 255 technology decision-makers who know how much BI data their firm uses (1,000+ employees) (These percentages are estimated based on ranges reported. These values are not exact.) Source: Business Technographics Global Data And Analytics Survey, 2014, Forrester Research, Inc.
Data Catalogs for Hadoop Achieving Shared Knowledge and Re-usable Data Prep Neil Raden Hired Brains Research, LLC Traditionally, the job of gathering and integrating data for analytics fell on data warehouses.